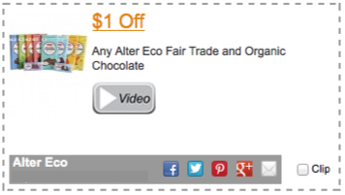 Save $1.00 on Alter Eco Organic chocolate with this coupon! This entry was posted in printable grocery coupons and tagged alter eco, alter eco coupon, alter eco printable coupon, chocolate coupon, coupon, organic coupon, printable coupon by commonkindness. Bookmark the permalink.